A Republican candidate for State Senate in District 27 has a colorful and troubled political past. 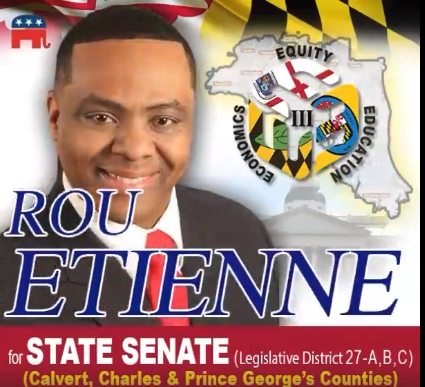 Roussan “ROU’ Etienne Jr. is one of two candidates running for the Republican nomination for State Senate in District 27 to, presumably, run against Senate President Mike Miller in the General Election. 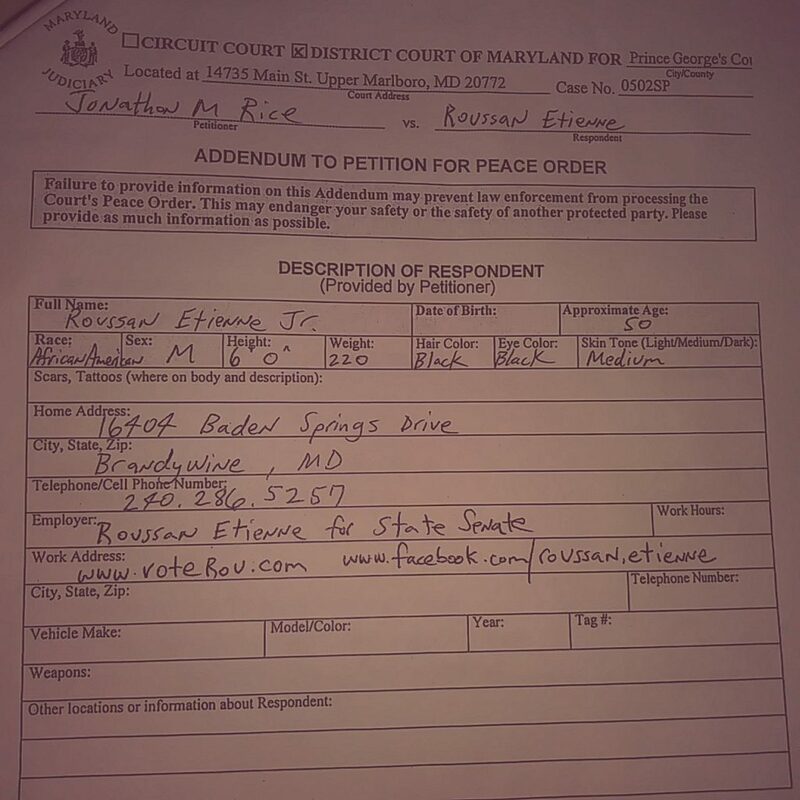 Etienne, however, has a troubled political history including making embarrassing statements, restraining orders, and being removed from the Prince George’s County Republican Central Committee. 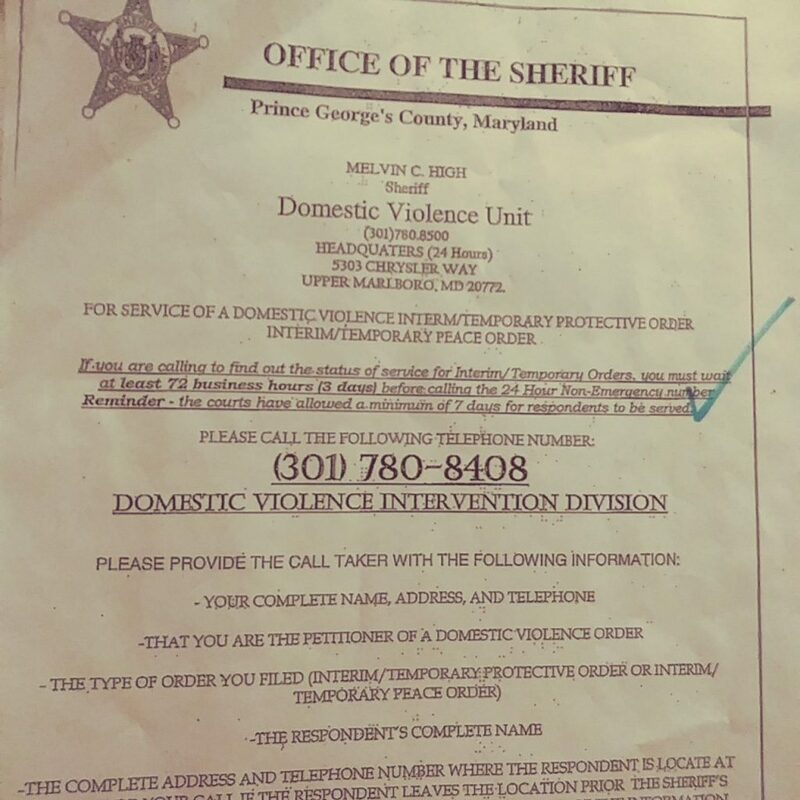 Etienne was a registered Democrat when became an unaffiliated candidate to run for Prince George’s County executive, a race he of course lost. After that election Etienne became a Republican and became involved in the party, looking to run for office again. 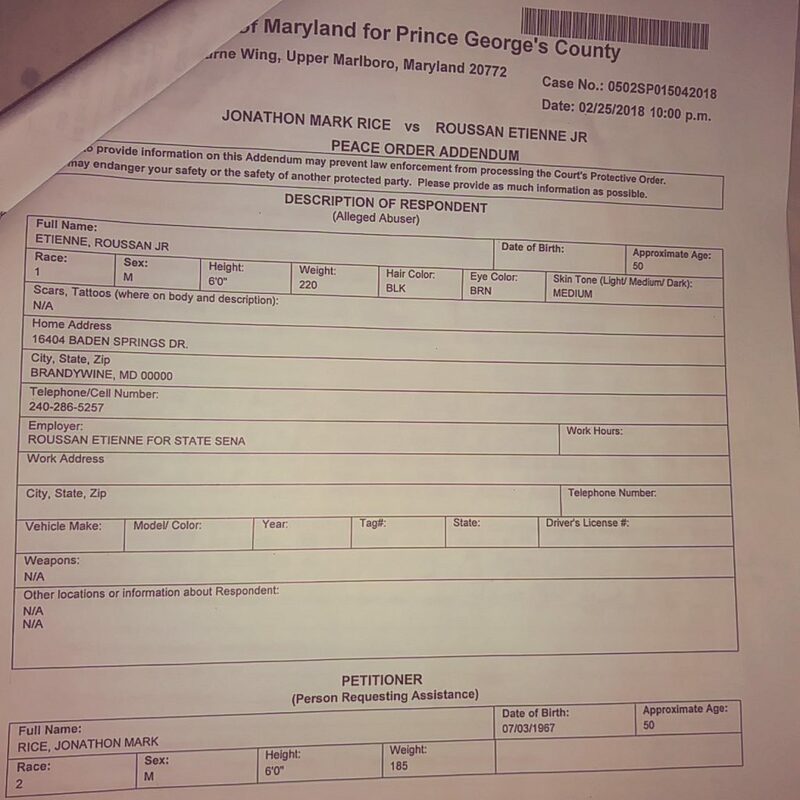 Etienne was appointed to the Prince Goerge’s County Republican Central Committee but was removed for cause from the Central Committee last month. I reached out to Prince George’s County GOP Chairman Brandon Cooper for additional information about his removal, but Cooper declined to comment. Sources also tell Red Maryland that Etienne was physically removed against his will from a private meeting with Senator Tim Scott (R-SC) after screaming and approaching the Senator in a threatening manner because the Senator wouldn’t endorse him on the spot. Red Maryland has obtained video of these incidences. 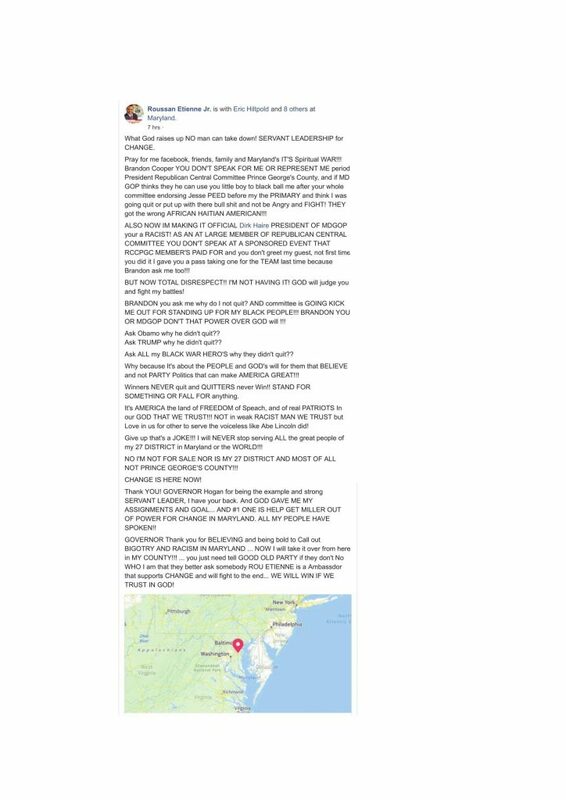 Etienne has publicly posted on social media statements calling several MDGOP staff and state central committee members racist, including MDGOP Chair Dirk Haire. 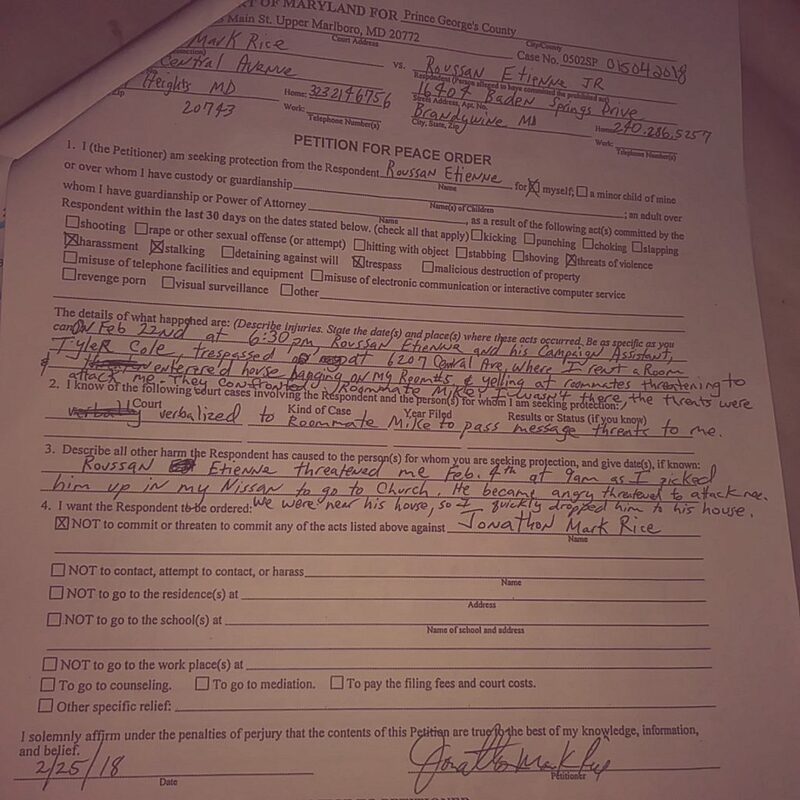 Etienne also had a temporary restraining order issued against him by a Republican 5th District Congressional candidate Johnny Rice for coming to the candidate’s house to threaten him. 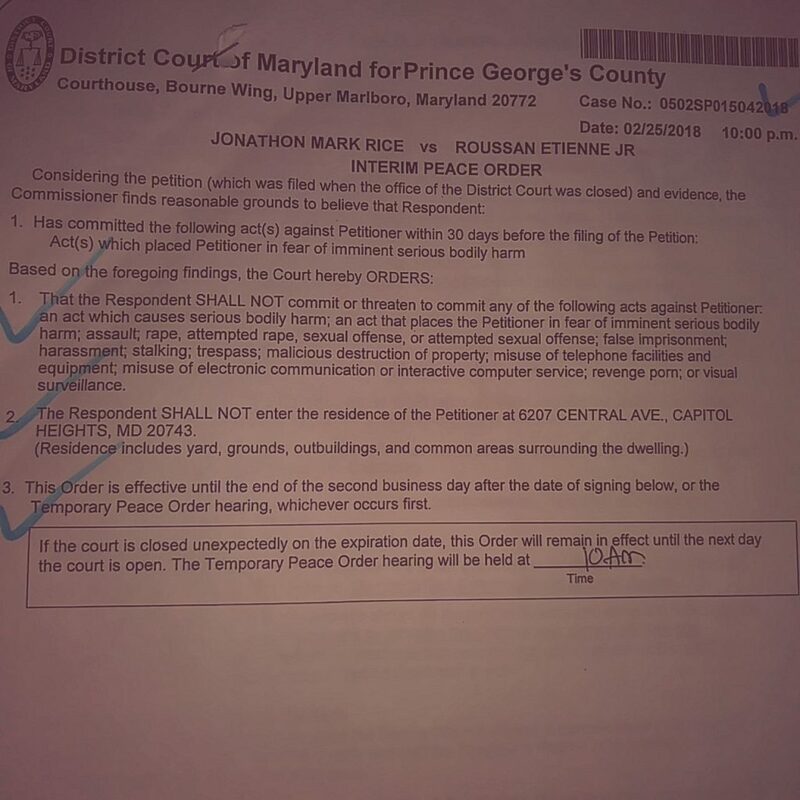 Ultimately the peace order was denied, however, the court stating that there was no statutory basis for relief for Mr. Rice. The issues with Etienne also extend to his field director, who attended a Central Committee Meeting and threatening Central Committee members, including the harassment of a member of the central committee on Facebook, including calling him slurs and threatening him. 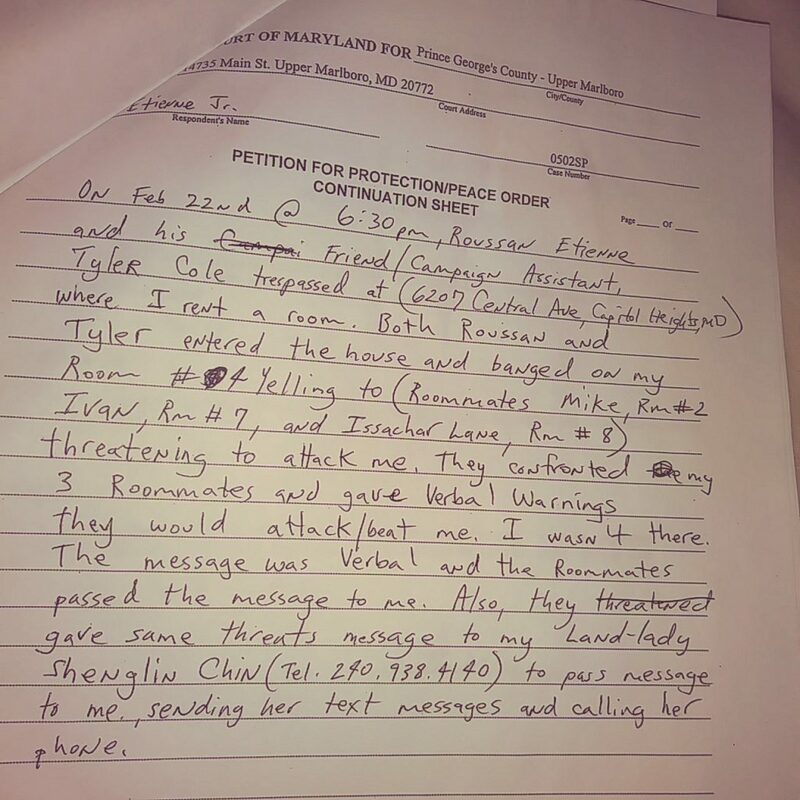 That Central Committee member ultimately resigned from the committee later that week and cited the threatening behavior from the field director as a reason. Finally, on Friday night Etienne attended a hospitality suite sponsored by the Prince George’s County Central Committee at the Spring Maryland Republican Party convention and aggressively took over the stage to speak. Every other candidate speaking had paid to be co-sponsor of the event, while Etienne did not. Needless to say that these kind of antics and these kind of outbursts are not productive and are not useful coming from a candidate running in a potentially competitive district. Republican voters in District 27 should think long and hard about the vote they cast in the June 26th primary.